For Starbucks, the annual reveal of their "red cup" is meant to signify that the holiday season is approaching. Instead, it's stirring up controversy. The iconic red cup has featured several winter-themed designs since it first appeared in 1997. From minimalist snowflakes and hand-drawn reindeer to a winking snowman and decorative ornaments, each year the design is distinctive and different from the last. This year's design is simplistic: an ombre from bright red to dark cranberry. 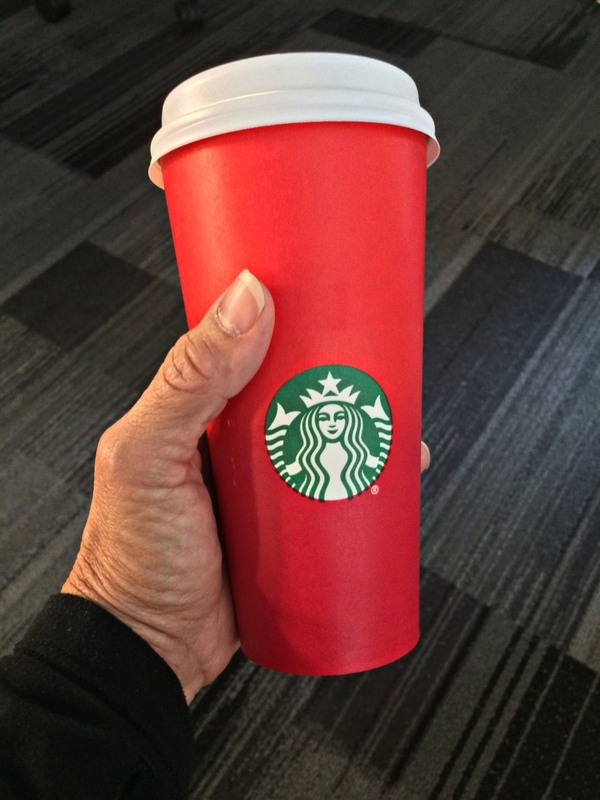 While some social media users have praised the minimalist design, others think the cups are a "war on Christmas." Even Donald Trump weighed in on the controversial cup during a rally in Illinois on Monday. "No more 'Merry Christmas' at Starbucks. No more," Trump said, noting that the coffee giant is among his tenants at Trump Tower in Manhattan. "Maybe we should boycott Starbucks. I don't know. Seriously. I don't care. By the way: That's the end of that lease. But who cares? Who cares? Who cares?" Starbucks, however, maintains that their cups were meant to be a blank canvas for customers to create their own stories, inspired by the doodles and designs that customers have drawn on white cups for years. "In the past, we have told stories with our holiday cups designs," Jeffrey Fields, Starbucks vice president of Design & Content, said in a statement. "This year we wanted to usher in the holidays with a purity of design that welcomes all of our stories." Joshua Feuerstein, a former television and radio evangelist with more than 1.8 million followers on Facebook, took to the platform to comment on Starbucks' new cups. "Starbucks removed Christmas from their cups because they hate Jesus," he wrote, asking followers to use the hashtag #MerryChristmasStarbucks and to ask baristas to write "Merry Christmas" on their cups instead of their names. "I think in the age of political correctness we've become so open-minded our brains have literally fallen out of our head." Feuerstein said in his Facebook video. "Did you realize that Starbucks wanted to take Christ and Christmas off of their brand new cups? That's why they are just plain red." However, not everyone agrees with this notion. In fact, some have pointed out that Starbucks carries a special "Christmas blend" coffee. "I think it's a non-event from a traffic and stock perspective," Will Slabaugh, managing director at Stephens, a financial services firm, said. "It's blown up on social media among a select group of consumers and non-consumers that likely won't change their habits." Katie Little contributed to this report.